If you are looking for the best stain for cedar decks in a water-based product, then look no further. DEFY Deck Stain for Hardwoods is a synthetic, semi-transparent finish specifically formulated for use on cedar, mahogany, redwood, and other dense or difficult to penetrate woods. DEFY Hardwood Stain also works well on composite woods. It is a VOC-compliant stain that penetrates wood pores to block out water and provide long-lasting protection from weather damage. DEFY Deck Stain for Hardwoods can be used on interior or exterior smooth hardwood surfaces including: wood siding, decks, outdoor wood furniture, and other hardwood surfaces. For more porous surfaces such as pressure treated lumber, pine and cedar log siding, or rough sawn lumber, use DEFY Extreme Wood Stain. 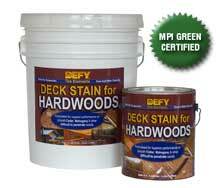 DEFY Deck Stain for Hardwoods is available in Cedar Tone, Light Walnut, and Natural Pine. Finding a cedar stain or redwood deck stain product that actually works is difficult, as most deck stains have trouble penetrating oil-rich or dense wood types. This product was specifically designed with smaller resins to penetrate better which helps eliminate surface buildup and peeling. 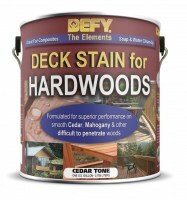 Other products out there claim to be the best stain for cedar decks but there is only one DEFY Deck Stain for Hardwoods. DEFY deck stains will give you years of protection for your deck and are easy to maintain. When the surfaces begin to look weathered and worn, which should normally be every 2-3 years and 3-5 years for the vertical surfaces, simply reapply a light maintenance coat. No need to strip the deck every time. It may be beneficial to use DEFY Wood Brightener to clean and brighten the surface before the maintenance coat. DEFY deck stains contain powerful sunscreens to block damaging UV rays. Ultra violet rays cause wood to turn gray and become susceptible to water penetration and decay. DEFY Deck Stain for Hardwoods contains synthetic resins that do not attract mildew and algae like other natural resin stains (oil-based products) do. Additionally, DEFY deck stains are water repellent.